Eckernförde/Vienna: On Saturday Night, Viennese production company Terra Mater Factual Studios was honoured within a festive gala for two productions in the categories ‘Best Film of the Festival’, ‘Best Postproduction’, ‘Praising Mention for Advancement in Camera Technology’ and the special prize ‘Green Report’ at the international Nature Film Festival GreenScreen. ‘The Ivory Game’, a thrilling feature documentary about the worldwide, illegal ivory trade, was able to convince the jury not only on aesthetic and dramaturgical terms, but also with its political and societal message. The Docuthriller, which was already shortlisted at the 2017 Oscars, was nominated as ‘Best Film of the Festival’. 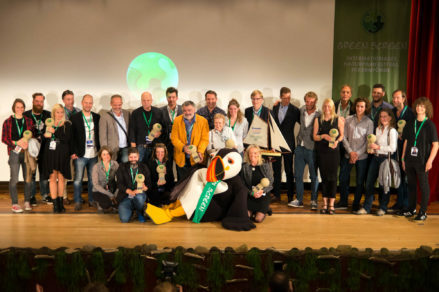 Furthermore, it was honoured with ‘Best Postproduction’ and the special ‘Green Report’-award. Another production of Terra Mater Factual Studios got a ‘Praising Mention for Advancement in Camera Technology’: the already multi-awarded ‘David Attenborough’s Light on Earth’. Presented by natural history legend Sir David Attenborough, this science/nature documentary reveals never-before-seen behaviour of living creatures producing their own light with the help of extremely light sensitive cameras. 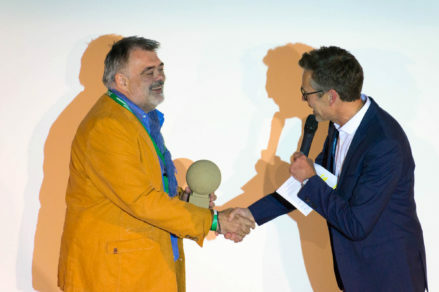 TMFS-CEO Walter Köhler at the award ceremony. The happy winners of the 2017 GreenScreen Festival.